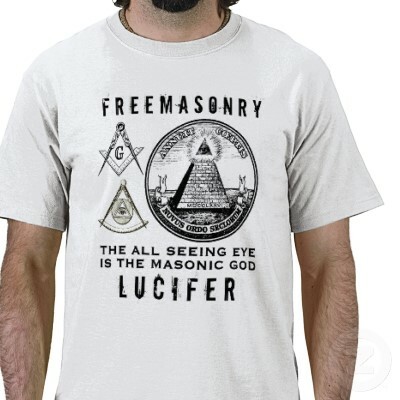 Most Christian websites make the claim that Freemasonry is Luciferian. Many Freemasons themselves will openly proclaim they are Luciferian. However, does being a Luciferian mean that one worships Lucifer or Satan? First of all, I want to make clear that I am not a Freemason, never was, and never will be. I have known and worked and been acquainted with many Freemasons and former Freemasons and have studied it for over 20 years (including reading Albert Pike's Morals and Dogma). When my father immigrated to America from Greece in the early 1970's, he became a Freemason in Boston to network as an electrician. After being initiated in the third degree and attending a few meetings, he stopped attending and never went back. Today I am in possession of the written material they gave him as well as his lambskin apron. My uncle with who I am close is currently an active Freemason, who wears his Masonic ring, attends regular meetings, and is mainly involved to network as he also is an electrician. We also have openly discussed on a few occasions the topic of Freemasonry. Growing up my parish priest was also a Freemason, though I only saw it in the ring he wore and never discussed it. Lucifer is the King James Version rendering of the Hebrew word הֵילֵל in Isaiah 14:12. This word, transliterated hêlēl or heylel, occurs only once in the Hebrew Bible and according to the KJV-influenced Strong's Concordance means "shining one, morning star, Lucifer". The word Lucifer is taken from the Latin Vulgate which translates הֵילֵל as lucifer, meaning "the morning star, the planet Venus" (or, as an adjective, "light-bringing"). The Septuagint renders הֵילֵל in Greek as ἑωσφόρος (heōsphoros), a name, literally "bringer of dawn", for the morning star. Kaufmann Kohler says that the Greek Septuagint translation is "Phosphoros". Many Christian commentators have interpreted Isaiah 14:12 to refer to the fall of Satan, who before his fall was an angel of light. Yet within context, it does not refer to Satan but to a king of Babylon, though the wording can be made to allude to the fall of Satan. With this in mind, to call Satan Lucifer only makes reference to his former glory as a shining angel, and not his current state as a fallen angel of darkness. In fact, in the Latin Vulgate in II Peter 1:19 Jesus Himself is called "lucifer", for He is the true morning star. Lucifer, the Light-bearer! Strange and mysterious name to give to the Spirit of Darkness! Lucifer, the Son of the Morning! Is it he who bears the Light, and with its splendors intolerable, blinds feeble, sensual, or selfish souls? Doubt it not! However, as is common among critics, this quote is always taken out of its context. In fact, when it is read in context the reader will clearly see that he is questioning the fact that Satan, who should be associated with darkness, is called "Lucifer" or a "light-bearer". Léo Taxil (1854–1907) was the first to claim that Freemasonry is associated with worshiping Lucifer. Taxil is still often quoted by critics of Masonry in the association of it with the worship of Lucifer. Yet Taxil was exposed and he publicly announced that his claims against Freemasonry were fictitious. Thus when a Freemason calls himself a Luciferian, he only means it in the context of being a light-bearer by doing good deeds through his philanthropy. Much more can be said on this topic, but I will leave it at this for now. Though Freemasons do not worship Lucifer, there are other issues with Freemasonry that it would not be prudent for Christians to be involved with it, especially clergy. For example, because Masonry is a fraternity with vows of secrecy and strong networking, it often happens that preferential treatment is given to fellow brother Freemasons over that of fellow Christians or clergymen who are not Freemasons. The other main issue with Freemasonry is that, even though it is required to believe in a monotheistic God to be a member, it also proclaims that salvation comes from doing good works alone, which is why Freemasons are such great philanthropists. Thus Freemasonry can be easily replaced with the Church, through which Christians are primarily called to do their philanthropic work and serve in their mission specifically in the name of Jesus Christ. These are the two primary reasons why I believe Orthodox Christians should not be Freemasons, and it is these two reasons primarily that have led the Church of Greece to condemn Freemasonry and prohibit Orthodox Christians, especially clergy, from joining.